Like every other trendy diet follower, Morningstar Farms can’t wait to tell you that it’s vegan now. The Kellogg-owned company behind Chik Patties and fake bacon strips and Spicy Black Bean Burgers announced plans to makes all of its products 100% plant-based (vegan) by 2021. Vegans who don’t read labels very well may be surprised to learn that many Morningstar Farm products contain egg whites or milk fat. Just last year, the company switched its popular Buffalo Wings, Chik’n Nuggets, and Buffalo Chik Patties recipes so vegans could work off their hangovers with Buffalo Wings like the rest of the planet. 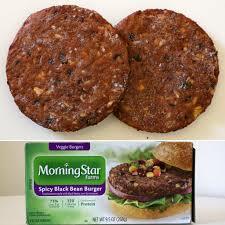 This entry was posted in News and Views and tagged Kellogg, Morning Star Farms, Spicy Black Bean Burgers, vegan. Bookmark the permalink.